Award-winning cookbook author Olia Hercules takes a culinary trip through the Caucasus--the vibrant region that bridges Europe and Asia --and share the recipes, stories, and striking images of this rich region. 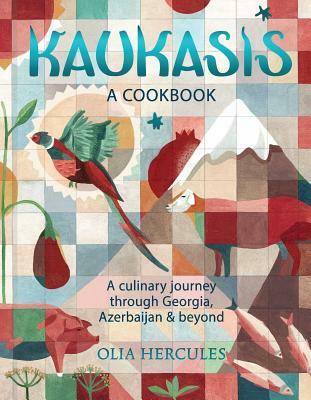 In this gorgeous cookbook, Olia Hercules shares more than 100 dishes that celebrate the food, flavors, and unique culinary heritage of the Caucasus--Georgia, Azerbaijan, Armenia, Iran, Russian, and Turkey. Kaukasis charts Olia's exploration of this unfamiliar area and introduces its wonderful cuisine that combines European and Middle Eastern ingredients in ways that are fresh and new. Olia Hercules was born in Ukraine and lived in Cyprus for 5 years before moving to London to study a BA in Italian language, followed by an MA in Russian and English. She then decided to train as a chef at Leith's School of Food and Wine. She kicked off her culinary career working at London's Union Market before becoming chef-de-partie for Ottolenghi's. She has since gained national and international recognition for her culinary prowess and engaging personality and is a highly regarded chef, food stylist, and writer. Olia has appeared on The Food Network, launched an online startup (The Recipe Kit), contributes articles and video to the Guardian, which recently named her a Rising Star of 2015, and authored the critically acclaimed cookbook Mamushka. Find out more about Olia at oliahercules.com.